Home News Our New CD – Now available everywhere! Our New CD – Now available everywhere! 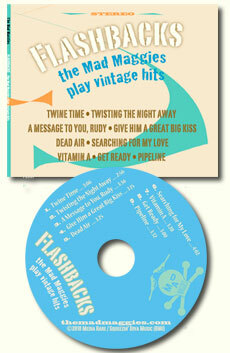 "Flashbacks – the Mad Maggies play vintage hits", is now available throughout the digital universe. We invite you to listen, buy and share with everyone you know. CDBaby – "the" friendliest, most supportive place for indie artists. They provide nice, long audio previews and an easy to use 5 star rating and comment section, CDs or mp3 downloads. iTunes – 5 Star rating and comments section, mp3 downloads. Amazon – convenient customer review and 5 star rating process, mp3 downloads. DigStation – 5 thumbs up and comment section, individual or album mp3 downloads. Add us to your Rhapsody playlists. Or simply stay connected via email. We love you. We’re making music for you, our fans and friends. We want to keep you happy and dancing. Let us know how we’re doing. Show us your love. Word of mouth is the lifeline for an indie band like us. Your taking a moment to give us stars or a review or telling someone about us is seriously valuable…essential actually. We dipped into the past for 9 musical gems and gave ’em the inimitable Mad Ms musical touch. Flashbacks, music, the mad maggies, vintage hits.